Apparently the new It thing in the food world is the ‘flexatarian diet’. I’ve read articles about it, and definitions of it, and I’ve heard its praises sung from the rafters. But here’s the thing, I honestly can’t figure out what it is. So, to recap, the Flexitarian diet amounts to eating more vegetables with your meals and sometimes don’t eat meat at all. I remain baffled. How is this a diet? How is this not how people eat anyway? How is this not just basic common sense? I guess I’m answering my own question, if this isn’t how people eat normally than clearly it does in fact need to be a defined and promoted diet no matter how obvious I think it seems. I will say in watching food TV I am always disconcerted by the lack of vegetables being prepared, and by the number of complete meals I see being presented that don’t involve a vegetable at all. Ina Garten and Sandra Lee at opposite ends of the food spectrum are both particularly guilty of this. One of the suggestions of the flexitarian movement is the idea of “Meatless Monday’s” where you eschew eating meat for one day a week (a la WWII (US) rationing). I have friends who are wildly unimpressed by the vague gesture at a commitment to diet change embodied by this idea. I’m a little more generous and think that if it can get people to expand their dietary horizons and make a commitment to not eat meat at least one day a week it’s not a terrible idea (although it’s also not the earth shattering life change that I’ve seen it being promoted as either, or at least it shouldn’t be). Admittedly I could probably do better about eating less meat, although our house is already just this side of hippie granola healthy and I’m not sure it needs any additional nudges closer to the edge. My problem with including more vegetarian dinners in my diet is finding a protein base for the meal. I intensely dislike tofu in all forms, and I don’t want to use cheese and/or eggs as my protein base more than once a week. I look at a lot of vegetarian recipes and wonder where the protein is, because I like pasta as much as the next starch obsessed girl, but I also need a protein on my plate. I eat yogurt for breakfast and usually have salad or soup for lunch, so by the time I get to dinner I really need to indulge in actual protein and polenta with some roasted vegetables is tasty but needs an egg or some meat to be satisfying for dinner. Even with my insistence that a balanced meal consists of a starch, a vegetable and a protein we’re still mostly eating vegetables. Generally the proteins in my house are small quantities of chicken or fish, sometimes eggs or beans, very rarely red meat. Dinner tends to be the most elaborate and heaviest meal of my week, as witnessed by the meat-fest below (for values of meat-fest that involve about a quarter pound of 87/13 ground beef per person). The rest of the week is far more abstemious – dinner this Friday is a riff on avglomeno soup, but made with bulgur wheat instead of rice, as an example of both asceticim and exactly how earthy crunchy my pantry is that I didn’t even have to go out and buy bulgur wheat to make this soup. My love affair with anything spiced with cinnamon and including a dried fruit is not even remotely a secret. That being said, I’ve been staring at this recipe since it came out in Bon Appetit a year ago and trying to decide what I think of it. It’s not that I think any of the flavors would be bad together, I just wasn’t sure whether the meatballs would be dry and dense and whether it would all end up so soupy that you couldn’t really serve it over couscous. Having skimmed the 52 reviews on epicurious without coming to a definitive conclusion on either one of those issues I finally decided that I was just going to have to try it for myself. So this is me trying it. Conclusion? Well, I think there was a dribble of sauce left at the bottom of the serving dish so I’m going to count that as a win. The meatballs were not dry, and I suspect would be even more tender if they’d been braised in the oven as the recipe suggested rather than simmered on the stove top which is what I ended up doing for practical reasons. I do think, however, that couscous is a little too fragile to stand up to the sauce. 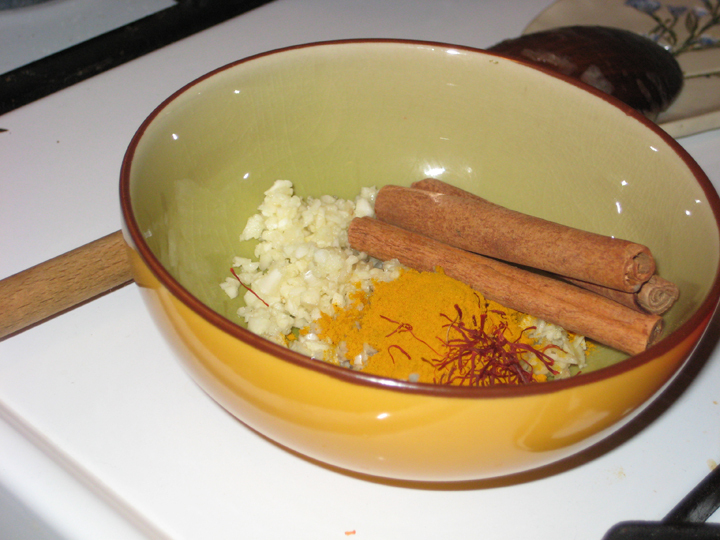 The tagine cooks down, but not enough to serve on a plate – I used shallow bowls – and the couscous gets a little lost in the liquid. 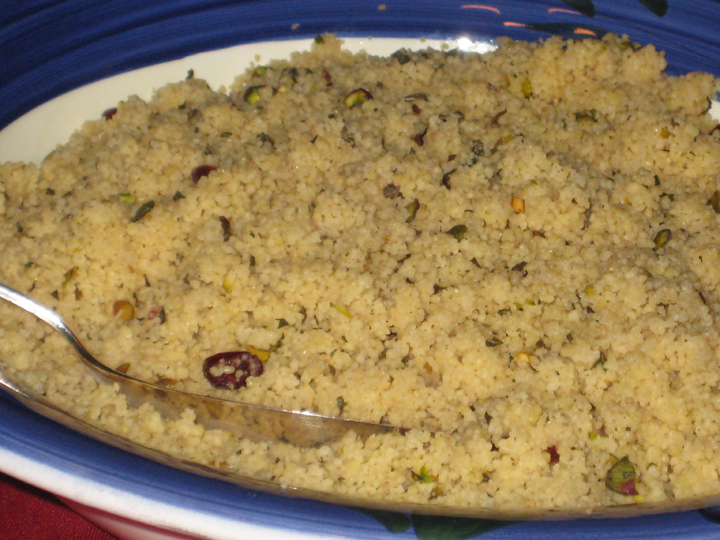 I think next time I’d experiment with an Israeli couscous which is heartier, or serve it with bread to mop up the sauce. Line large rimmed baking sheet with plastic wrap. Gently mix all ingredients in large bowl. 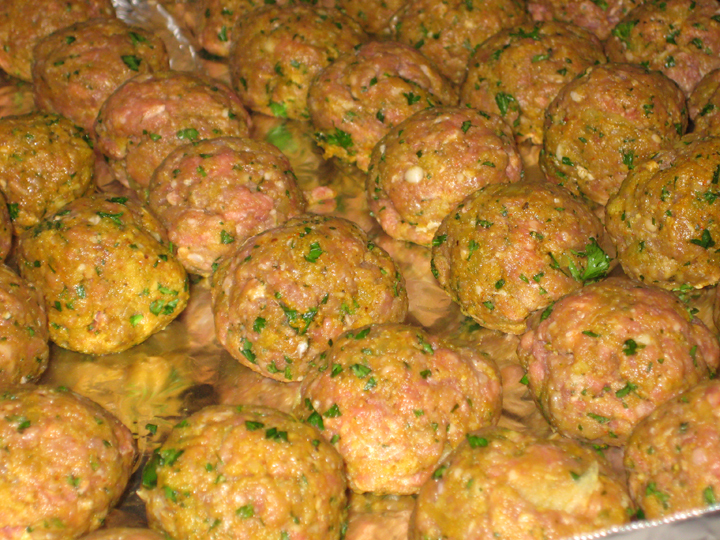 Using moistened hands and scant 2 tablespoonfuls for each (= 34 grams/1.25 oz because I found it easier to just weigh them than to measure them with a tablespoon), roll meat mixture into 1 ½” meatballs. Arrange meatballs on sheet. Note: I recommend chilling the meatballs overnight, or for at least a few hours. It helps them hold together when you add them to the stew. Preheat oven to 350°F. Bring stew to simmer. Stir in carrots. Carefully add meatballs to stew; gently press into liquid to submerge. Cover pot; place in oven. 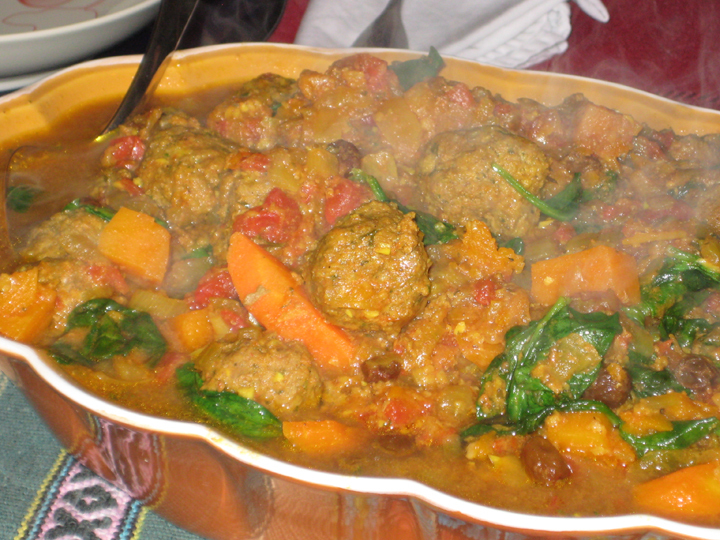 Bake until meatballs are cooked through and carrots are tender, about 35 minutes. Sprinkle spinach over stew. Cover and bake until spinach wilts, about 5 minutes longer. Gently stir to mix in spinach, being careful not to break meatballs. Remove cinnamon sticks. Season tagine with salt and pepper. Bring stew to a simmer. Add the carrots. Carefully add the meatballs to the stew; gently press into liquid to submerge. 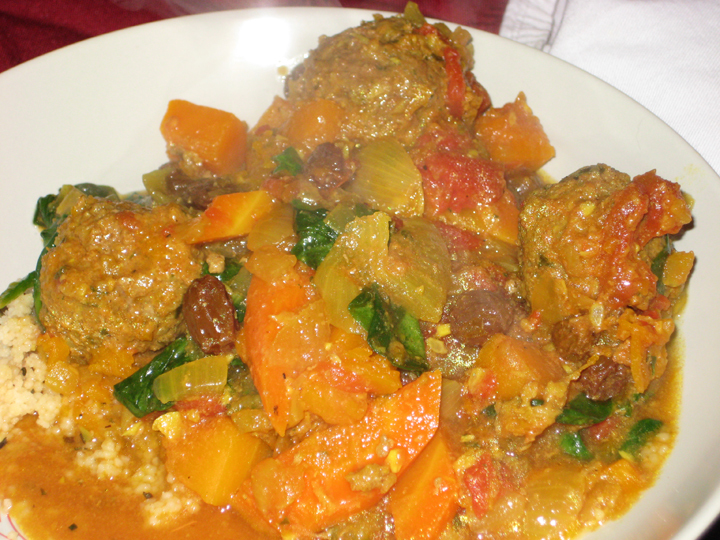 Simmer uncovered on stove top for 35-40 minutes, or until meatballs are cooked through and carrots are tender. Sprinkle spinach over stew. 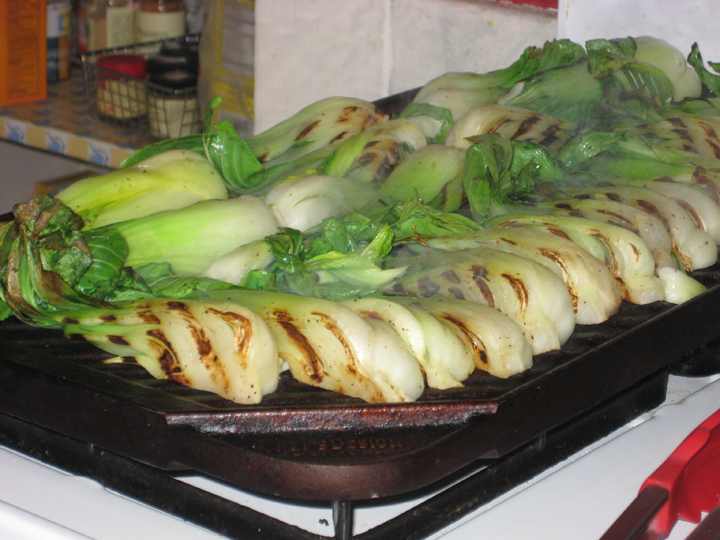 Cover and continue to cook until spinach wilts, about 5 minutes longer. Gently stir to mix in spinach, being careful not to break meatballs. Season tagine with salt and pepper. Remove the cinnamon sticks. * I made 1.5x the recipe and used 2 cups butternut squash and 1 cup carrots. This is not specifically because I dislike cooked carrots, although I do. This is mostly because I had 2 cups of diced butternut squash leftover from a dinner last week that needed to be used. It worked nicely. I might replace all the carrots with squash next time because I really do dislike mushy carrots in stews. It looks beautiful. I’m sold. On the menu for the weekend. Did you use cilantro in the meatballs?